What do your students need to grasp to really understand fractions? Is there a short list of formulas they should memorize? Does it all come down to basic familiarity with algebra, and being able to simplify down? Not really. If your students understand fractions visually—if they have a mental image that pops up in their head whenever they see a fraction on the page—they understand fractions. It’s that simple. The focus of this lesson is a key formula your students need to understand in order to get further in fractions, but when translated into real life terms it is an extremely simple and obvious concept. If you divide a portion of a whole into a certain number (n) pieces, how many of them would you need in order to have the same amount as you did originally? N, of course! That’s why this discovery-based lesson is focused on visual representations, and why you want to play with real-life fraction like oranges when introducing the concept. In this lesson you’ll also be having your students drawing, coloring, and superimposing so the idea can be really thoroughly cemented in their minds. That students would be able to use visual fraction models, like oranges or drawings on paper, to explain why a fraction a/b is equivalent to a fraction (n x a)/(n x b), and that they would be able to use this idea to make their own lists of equivalent fractions or recognize equivalent fractions in a list. Vocabulary: partition, equivalence, fractions, reason, denominator, numerator. Crayons or colored pencils that can be used for shading. Start with vocabulary, so you and your students will all be speaking the same language. Write the ‘wordlist’ out on the board, ask the students what each word means, and then summarize each definition after the word. You’ll want to use these words throughout the lesson, but don’t assume your students have them memorized unless you have a good reason to believe so. The focus of this class isn’t words, and though precise mathematical speech will only be helpful in the future, there’s no reason to confuse students over terminology. Now pick up your unpeeled orange. Tell your students you are going to partition this orange. What does that mean again? Yes, you’re going to divide it in parts! Split the orange in half. How many parts did you partition it into? 2! Ask a student to come and write a fraction describing one of those pieces on the board. He should have no trouble coming up with ½. Ask him to divide it into half, and then write the fraction denoting one of the resulting pieces on the board. Then, ask him to denote a fraction denoting both of the resulting pieces. Walk him through any part of this he has trouble with. Don’t draw attention to the sameness of the fractions just yet; but if anyone discovers it on their own, acknowledge them and allow them to share their discovery with the class. Ask your demo student to sit down again. Give each student four index cards. Ask him to divide the first one in half, and shade half. When this is done, go to the next. Ask him to draw the same line and partition it into half and then to make a crosswise line as well to partition once more. How big is each part? One fourth. Walk the students through partitioning the remaining cards into sixths and eighths. When all the index cards are divided, ask your students to shade half of the first index card. Ask them to shade 2/4th of the second, 3/6th of the third, and 4/8th of the fourth. Write each number down on the board as you request it. Then ask them to look at all the index cards and tell you if they can see any interesting patterns on them. It won’t be long before someone makes an important observation: they’re all the same! Are the pieces the same size? No. Are the same number of pieces shaded? No. But the total amount shaded is the same on each card. Now you want to draw everyone’s attention to the numbers on the board. Are these numbers the same? They don’t look the same. What is the same about them? Give them some time to discuss the problem with their neighbors and consider solutions. a/b = (n x a) /(n x b) Look, this is what we’ve just discovered. A fraction is always equal to itself multiplied by the same number on both top and bottom. Now ask your students if they can show you why this is true using their index cards and a pair of scissors. Make the first half cut on your index card, and observe this is ½. Ask how you can show multiplying the bottom by n (cutting each piece into n pieces). Ask how you can show multiplying on the top by n (taking n of the existing pieces). If multiplying on the bottom is cutting into n pieces, and multiplying on the top is taking all n, it will be obvious why you get the same amount of material each way. If you have the same total amount—even if the pieces are different sizes, and even if there are a different number of pieces—you have ‘equivalent fractions’. When they’ve demonstrated they understand the material, hand out the worksheets and give them some time to fill them out. 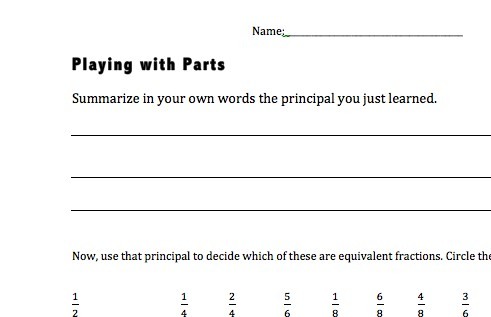 Allow them to discuss the best way to summarize the principal in the first half of the worksheet, if desired. 4.NF. 1 Extend understanding of fraction equivalence and ordering.